With warm Mediterranean climate and plenty of opportunities for outdoor activities, water sports and day excursions, the island of Kos is the ideal place to spend your summer vacation. Located in an idyllic spot in Kipriotis village of Kos is the beautiful Kipriotis Village Resort, which provides delightful stay in spacious rooms and apartments offering marvelous views of the Med. It is the ultimate family-style hotel by the sea, complete with Olympic-sized pools, five delectable restaurants, a clutch of fine bars and numerous fun-filled activities for children, including mini clubs, mini golf and a toy store. The hotel has a gorgeous sea-front location and a stunning décor that reminds one of the by-gone golden era of Greek civilization. The Kipriotis Aqualand Waterpark is just a 10-minute-drive away. Kids can enjoy all sorts of water slides and rides, while their parents can relax and enjoy by the poolside or at the hotel’s Anaviosi holistic wellness spa. For those looking for an active holiday, the hotel offers fitness room, tennis courts, football ground, basketball and volleyball courts, as well as water sports such as scuba diving and kitesurfing. 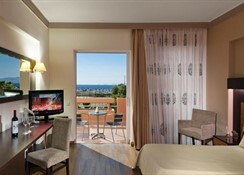 Kipriotis Village Resort is located in the stunning Greek island of Kos. There are regular ferries to Kos from Piraeus. But because of the distance between the two, it takes about 11 hours to cover the route. Along the way, the island connects with many other Greek islands including Rhodes, Patmos, Leros and Kalymnos. Travelling by air is another quick and comfortable way. The Kos airport is 22 km from the Kos town. Overlooking the vast Mediterranean, the village resort is a world in itself with 709 fabulously furnished and superbly appointed rooms and apartments. 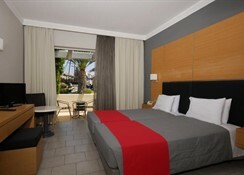 There are Double Rooms with spacious two beds or a large single bed. Family Maisonette offers two beds or a double bed with open sleeping areas. These rooms are perfect for families. The bigger rooms include Family Junior Suites, Family Apartments, Executive Suites, Junior Presidential Suites and Presidential Suites. The suites come with expansive beds, en-suite marbled bathrooms, Jacuzzis and outdoor terraces. Air conditioning, en-suite bathroom with hair dryer, Wi-Fi in public areas, satellite TV/radio, refrigerator, tea and coffee facilities, safe box and direct dial telephone are some standard amenities that are available in all rooms. The restaurants and the bars of the hotel serve delicious Greek cuisine and innovative cocktails with great views of the Mediterranean and impeccable service. The Atrium restaurants serves Greek dishes with stunning décor and an open-air vibe. Macedonia restaurant is more formal in nature. This indoor restaurant is known for its lavish lunch and breakfast buffets. The hotel also has a pool bar, a hotdog stand, a barbeque corner, a beach bar and a main bar at the terrace. The main bar is poetically named Mount Olympus and rustles up delicious cocktails and drinks. 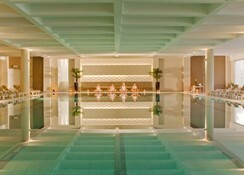 The hotel has a wellness spa with indoor swimming pools, sauna parlours and treatment rooms. There are a number of swimming pools in the complex, including an Olympic-sized pool, a whirlpool, a pool with water slides, 2 swimming pools for children and 2 paddling pools, and indoor pool and an outdoor Jacuzzi. Guests can also enjoy a lot of outdoor activities and sports such as billiards, table tennis, basketball, volleyball, tennis, football, beach volleyball and golf. The hotel arranges water sports such as scuba diving and kitesurfing. There is also a toy store for children, along with a jewellery shop in the hotel. Guests can indulge in a bit of a foot therapy at the hotel’s fish spa. Finally, the hotel is also an excellent choice for having business meetings and social gatherings. There are special packages that can be availed by the guests at attractive rates. Had a lovely stay here. Great for kids to. Had our 9year old boy with us who loved the olympic pool.Room was clean.We had ground floor & unfortunately there were loads of ants& cleaners didnt really sweep the area. Plenty to choose from with food but as any other All inc it gets monotonous after a while! Pools great with slides. Wouldnt hesitate to go back.